My name is Marilyn Gang and I am the "head honcho" of the Toronto Dowsers. Our Dowsing group had a strong connection with Raymon Grace in our beginning years as we significantly helped him to become well known in Dowsing circles, and beyond, with our support, recognition, publicity and good words, at that time. Dowsing pioneers Abbé Mermet and then Hannah Kroeger evolutionized Dowsing. When using the pendulum, they took it from the passive mode of detection to the active one of actually changing the energies. Raymon went further to develop these techniques, helped, too, by his background as a Silva instructor to simplify them and show us how we can easily, immediately, obviously change our lives and the lives of those we care about to achieve beneficial results. His techniques and teachings have improved our situations and our lives and our dowsing. Raymon visited Canada frequently, until July 2005, to share his simple wisdom with us. Still, not enough people were dowsing on a frequent enough basis. They had not organized their notes and didn't have their charts handy. Charts are pretty important when you are using Raymon's techniques. So I got the idea of making up a Dowsing Card. (I have to do this. I'm a former language teacher, Virgo and detailed oriented.) This has the six questions that Raymon and Larry Huszczo, Raymon's colleague, considered to be the most beneficial, plus several more that were added later on in an update. It also has Walt Wood's chart which many people find useful just on its own. I worked with Raymon and Larry for a month on the wording of the cards. The cards were printed at a cost to our group of $575 CDN for 1500 cards. They loved them. They were distributed free to the members and others purchased them at $1 / apiece so we could cover the printing costs and then give many away which we are now doing. When you use these questions on a daily basis (takes maybe 2-3 minutes) your energetic immune system strengthens considerably. It takes 21 days to establish a habit. To create good dowsing habits, I decided to sweeten the incentive. The offer, to everyone who was at that meeting (140 people): "To everyone who is here tonight, if you use these cards on a daily basis for 21 consecutive days, I will take you out to dinner, in groups of 6. My choice, here in Toronto. Offer good until August 31st." Now, I'm a highly curious person. My curiosity and 'experiments' with human nature sometimes override my financial common sense. I 'knew' not everyone would be able to do this, so I wasn't risking a lot. But here is the real reason behind my offer: Imagine --- that you are sitting at a table in a restaurant --- 7 of you --- and you are all doing this energy work. You sit and chat and relax with one another in a small group. Imagine what an energy form --- or structure, or vortex, group, whatever --- you are creating. It is these small groups of like minded people working together for a common positive purpose that will change our world. I have 4 groups that have done this work that I will take out to dinner this summer. I only wish there were more. However --- they are telling me that they will be taking me out! But that's fine. Anything is worth it as long as the true goal is reached. It kind of helps if you have some understanding as how to use the techniques. It helps to learn the "how's" and the "why's" from someone who really does understand this. It's not at all that difficult --- it just makes things smoother. "As using these techniques clears out non beneficial energies --- your personal energy, your personal magnetism is huge. This energy draws people. This is one of the reasons people are attracted to Raymon so much. People will be attracted to you, they will want to be around you, they will listen to you. You have to exercise responsibility with this as you can choose to become either a Jesus or a Hitler." We can be going about things in manner that is more beneficial for us: Rather than focusing so much on raising the energy, focus more on getting rid of non beneficial energies and frequencies. For when you get rid of something yucky, your energy is better. Higher. The more stuff you get rid of, the more energy you have. Compare it to being in a balloon. As you toss out the sandbags (your "stuff"), you rise. You are lighter, filled with more energy. Again, this is a sort of cleansing. As you get rid of internal toxins, your body is lighter and you have more energy. As the earth gets rid of toxins, the earth has more energy. As you get rid of clutter, your space has more and better energy. So it's not so much the energy raising, as the clearing (and transmuting) of detrimental energies that counts. I didn't put Walt's name on the cards because I figured everyone knows who created the chart. Folks here love them. Many laminate them. I gave away about 300 at the ASD convention and they are finding them to be valuable there, too. So, that's my story. I would like to hear from you, any insights or uses you have from the cards, any stories you would like to share. You can find out more about these techniques from the book Raymon wrote "Techniques That Work For Me" --- the techniques that gave birth to this Dowsing Card. It is available through the ASD bookstore: www.Dowsers.org and through Amazon. IT WORKS! If: YOU USE IT!!! 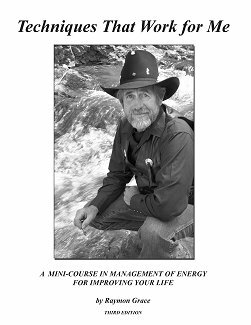 "The purpose of this manual is to give you the power to manage energy in such a way as to benefit those-to whom or situations at which you direct it. One point to emphasize is that we do not need complete information to solve a problem. What we do need is a willingness to do something about it. If we do nothing, nothing will happen. If we do something, something will probably happen. One of my beliefs is that no act of kindness,, regardless of how small, is ever wasted. All things are composed of energy, including our thoughts, and future events are composed of thoughts not yet materialized. If we combine our knowledge with that of the Spirit World, and use it properly, we can help change the energy around us and thereby change our future. At the same time, we contribute to beneficial energy for the change to better conditions on our entire planet. This is simply done using our minds through our thoughts, and most importantly, with intent. Healing, of various kinds, is one goal of this process." A Toronto Dowsers newsletter is written before every (mostly monthly) meeting. Receiving the newsletter is one of the many benefits of membership. Find out more about this at BENEFITS. Thank you so much! Please do enjoy and DO USE your Dowsing Card! ADDED NOTE #1: I am getting more requests for the card. It was intended for use for members of the Toronto Dowsers --- who took Raymon's workshop, or who read his book "Techniques that Work For Me". I have been mailing them out to people who are interested in them --- and --- I am slow in mailing things out because I'm the only one to do it and have too much else to do. It's really best to know his techniques before you use the card. If you want a card send $5 (if a check to: Marilyn Gang) to: Marilyn Gang; #816 - 225 Davisville Avenue; Toronto, Ontario M4S 1G9 Canada. I'll send you 2. ADDED NOTE #2: We had 2 printings of 1,500 cards each. We were getting low on cards and since more stuff was happening Raymon discovered more stuff and shared it with us. So we updated it and at the third printing, with the updates, we printed 2,000. We give away a lot of cards and that is why we also have to sell some. If you become a new member with us and you would like a card, make a distinct note of your request on your membership form and it will be included with your first newsletter mailing. If this is omitted, kindly fee free to kindly remind us.